You can easily make an adorable Valentine’s Day card. Pick one of these ideas to make one. Take a black and white patterned paper and write your love message on it with red alphabet stickers. Red color pops against the black and white background. This is the simplest way to make a card. You can make a peppier card with the next trick. Take a plain white glossy paper along with some patterned, assorted and glossy papers. American Crafts paper pads available at CreateForLess are a good choice because they are come with papers featuring a variety of colors and patterns. You can go for papers with Valentine’s Day themed hearts, flowers, butterflies, arrows, stripes, dots, kites and clouds. Use a circle cutter to cut some circles of various sizes out of different colorful papers. Now paste the smallest circle in the middle of the white paper and write your love message in it. Paste the bigger circles outside the smaller one and make them look like the ‘Target’ sign. This idea is better than simply buying a Valentine’s Day gift. Make personalized cookies or bake a fun batch of sweets to get that amazing smile from your partner. 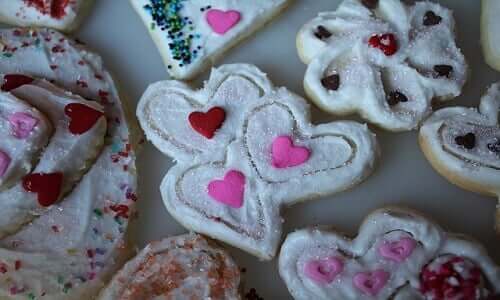 In order to make heart shaped cookies, take a cooking spray, 3 tablespoons margarine, 6 cups marshmallows, red food color 9 cups rice cereal and a heart-shaped cookie cutter. Coat a baking sheet with the cooking spray and set it aside. Now melt the margarine in a large pot using low heat. Add the marshmallows and stir continuously until they melt. Remove the pan from stove, put in some drops of red food color and stir. Now add the rice cereal and stir. Put this mixture on the baking sheet and spread it to even thickness. Use a heart shaped cookie cutter in the end. You can also use the 6 Cavity Valentine non-stick pan pack in place of a cookie cutter. This idea can really surprise your loved one. Take a heart shaped ice cube tray and fill each heart with water. Now put some pomegranate seeds and put them into each heart. Let this tray rest in the freezer until the water turns into ice. Now serve the cocktails with these ice cubes.